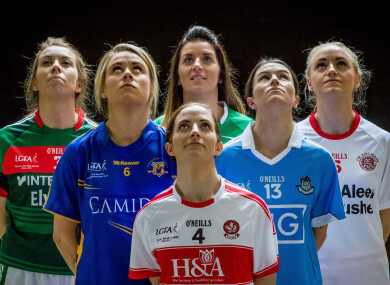 THE ALL-IRELAND TRIPLE header is the biggest day of the ladies football calendar, and the one day of the year when the best teams in the country will compete in Croke Park. Granted, two of today’s featured counties have already played in Croke Park this year as part of a double-header, but in principle, this is only occasion when we have inter-county ladies football at GAA headquarters. Naturally, that brings with it a heightened focus on the games and the outcomes, which is to be expected. But the level of interest invested in All-Ireland final day far outweighs the attention given to all the games that precede it. Today’s senior decider sees Dublin and Mayo contest for the Brendan Martin Cup and both sides share an interesting history. They previously met in an All-Ireland final 14 years ago, where a last-minute goal from the boot of Diane O’Hora snatched the victory from Dublin’s clutches and delivered a fourth All-Ireland title for Mayo. They also collided in last year’s All-Ireland semi-final, a thrilling contest which was decided by a Sinéad Aherne free at the buzzer. The teams have always been separated by marginal differences, but as an audience, we have come to know these things mainly through match reports, or in All-Ireland final previews. We don’t learn about them organically. Their style of play and match-form isn’t something we see unfolding in front of us throughout the campaign, and that implicates how we engage with the sport overall. We end up going into these All-Ireland finals a little cold. We know very little about how the teams play, who their key players are, and where the game will be won and lost. Even the provincial finals tend to pass over us. Both Waterford and Kerry scored wins over Cork in the Munster championship, but only the ardent Ladies GAA fans appreciated those results. In essence, it leaves us with one day of concentrated interest, and prevents us from forming a narrative of how the season is shaping up. That has to change if we are to widen our understanding of the nuances of Ladies GAA. To credit the Ladies GAA, live coverage of games is often available on Facebook, and highlights of matches are regularly posted on Youtube. It’s getting people to click in greater numbers that we need. Coverage of the game has undoubtedly advanced over the years, and the diverse range of articles leading into this All-Ireland final reflects that movement. But the need for further progress is still great, and in order to add for that momentum to grow again, the focus must now turn to other stages of the championship. Mayo’s All-Ireland semi-final victory over Cork sparked a considerable and significant reaction. In truth however, that wave of interest was driven largely by the magnitude of the result and the sensational end of Cork’s reign. Fans of men’s GAA are already anticipating the 2018 inter-county season and what the respective competitions might bring for their own county. The provincial leagues are largely negligible, but there is an appetite among fans to throw an eye over the competition and tease out where their team sits among the pack of early front-runners. That level of attention rises steadily throughout the National League and provincial competitions, and later peaks for the All-Ireland final. By contrast, the focus on Ladies GAA remains relatively low during the year, with public interest starting to soar in the build-up to the All-Ireland camogie and football finals. Indeed, people will obviously take notice of the today’s games but finding a way to spread the intrigue throughout the season is the next step. Email “Opinion: Public interest in Ladies GAA must extend beyond All-Ireland final day”. Feedback on “Opinion: Public interest in Ladies GAA must extend beyond All-Ireland final day”.